A building which most recently housed the Rodney Stinson American Legion Post 102 in downtown Stonington has been sold, but that does not mean an end to legion activity on the island. “The Rodney Stinson Post is still here,” said Legion Adjutant Debbie Alley, adding that the post will rent space at the neighboring Odd Fellows building to hold its meetings. Alley did not rule out another property purchase in the future, and said new members are encouraged to join. Those interested should contact Alley. The property at 40 Main Street was sold to Stonington Sunset House, LLC, Massapequa, N.Y. The current owner, Anthony Lobasso, said the building would be renovated, but said there were no plans to share at this time. Offered for sale in November 2010, the building dates back to the late 1800s and was originally built as a boarding house—called Sunset House—to provide housing for those coming to the area for work. 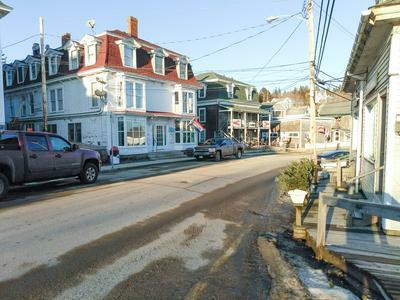 The town of Stonington, which was incorporated in 1897, had a population of about 4,000 people (far more than the 1,050 counted in the 2010 census), many of whom were working in the 12 operating granite quarries of the time. Much like the neighboring structure known as the Tewksbury Building, numerous boarding houses and many of the structures along the town’s Main Street were built circa 1880s to accommodate the influx of inhabitants. The building, early on, also housed a bakery and was used as a meeting place for another fraternal organization, the Knights of Pythias, before its more modern-day uses as a Stonington Post Office, meeting house for the American Legion and offices for local real estate companies. The building was sold to the American Legion Post in 1963 by Donald Coombs, a World War II veteran who survived the Bataan Death March. Coombs, who was the Stonington Postmaster for many years operated the post office from the first floor of the building while the Legion members met on the second floor. The post purchased the building for $3,500 on March 25, 1963. Rodney Stinson of Stonington was the first from the Island to go in the first draft contingent sent from Ellsworth to fight in World War I. He arrived in France in spring of 1918, serving in the 104th Infantry Regiment, 26th (Yankee) Division. The 104th received a surprise German attack on April 10, near the town of Apremont. Rodney was hit and died two days later of his wounds. He was 22 years old. The French awarded the regiment the Croix de Guerre. When the first American Legion post was organized in Stonington, it was named for him, according to information from the Deer Isle-Stonington Historical Society.